Great posts, Brooke! Thanks for writing them. I want to add another tidbit to the ‘why does astronomy do so well’ part. I’m not sure about other fields, but there is a strong and persistent bias against citizen science projects AS science in ecology. And this makes it hard to publish (high bar for explaining why the data is good) and really hard to get funding. You’ll see very few publications in the ecology group, and while, yes, I think part of this is time, the other part is that citizen science is often equated to outreach and education in ecology, where it has a long and storied history of being just that. I thought for a while that this was changing, but after chatting with people at the recent annual conference, I think it’s an ongoing problem for our discipline. It will be interesting to note differences in disciplines as the Project Builder gains more projects and so there are more data points within each discipline. I think I know the rapid astro publications you mean — Snapshot Supernova had 2 of them a couple of days after the project launched. Those are a good example of how publication norms change even within disciplines. People who study transient phenomena may publish many times a year, but in my sub-field that is far from normal. If I discovered a new type of object it would take me months (at least) to get that published. 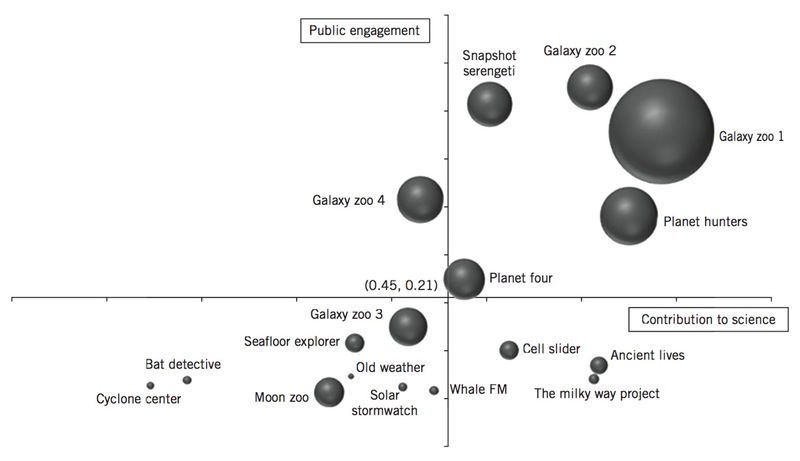 At the same time, I’ve gotten the impression that most of astronomy publishes more often than most of ecology. I’d love to be able to incorporate field-specific standards into “contribution to science” measurements. I’d have to reach out to our various friends in social science, information science and other fields to figure out how… but I think it would be worth it, as we clearly need to do better at this part. 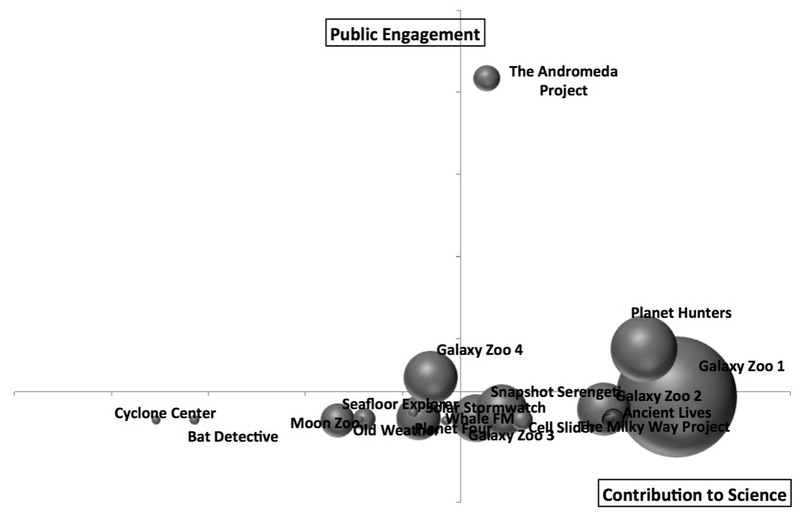 In the larger context beyond this success matrix, it would help us support other projects if we better understood how each field internally measures success, independent of whether it comes from citizen science or not. I think that could help break other scientists’ habit of thinking of citizen science as pure outreach.